Goodness comes from this place. So much goodness. I am back from San Diego, where it was a perfect 75 to 80 degrees all four days. What the literal hell happened here in ABQ while I was gone? I mean, it’s seriously scorching. Anyway, back to the beer talk. Last month, a team of folks from San Diego’s Ballast Point Brewing and Spirits came out and did a tap takeover at Nob Hill Bar and Grill. The Sculpin IPA and the Grapefruit Sculpin became instant crowd pleasers here in New Mexico. I casually mentioned to the Ballast Point guys that I would be in San Diego in a few weeks, and they offered a private tour. They hooked up my group with Curt Louret, a Ballast Point sales and marketing manager who met us at the Little Italy location at exactly the appointed time. We were treated unbelievably well and the personal attention was fantastic. It was great to see that it was not only the team members who came out for the tap takeover who were extremely personable, totally devoted, and undeniably passionate. It’s apparently a definite theme with their employees. After talking with Curt it is easy to see why. Yes, the nautical theme is present everywhere. Avid fishing fanatic Jack White (no, not that Jack White, but a rock star in my book nonetheless), founder of Ballast Point, has cultivated a great team — they are currently staffing more than 450 employees. All staff members are encouraged, regardless of their Ballast Point job titles or duties, to be creative and to brew beer. We are not talking just at home, but through an amazing R&D program called “Roots to Boots” at Ballast Point. Employees form teams of two to five people and brew on site in their five-barrel system with the help of the brewer. They are paid to hang out with each other to bond or enhance their current co-worker relationships, create a recipe, and make their own beer. If the beer turns out good, they will put it in on tap. There were two employee beers on tap the day we were there. If the beer is really, really good, it can and has become part of the rotation. If it’s not quite up to the Ballast Point standards, the brewer will work with them and discuss how to make it better. It is really the epitome of team work. Research and development happens here for Ballast Point. All the artwork for the labels and merchandise is designed by a resident artist and fisherman, Paul Elder. There is a nautical theme carried forward from the Ballast Point name and the founder’s (other) favorite pastime. Ballast Point even has two competitive fishing teams. This nautical theme is also the catalyst for the names of the beers themselves. A favorite among the Crew is “Victory at Sea,” a heavy-hitting 10-percent ABV imperial porter. I was fortunate enough to try Victory’s “summer sister” beer on site called “Calm Before the Storm.” Previously available on draft only, this 5.5-percent ABV cream ale is not in any way, shape, or form a timid beer. If you were served this beer in a dark glass, with your eyes closed, you would not guess it to be golden-hued. The vanilla and especially the coffee are very prominent. It rapidly became so popular that Ballast Point decided to bottle it. It remains to be seen if it will be available for purchase in bottles in New Mexico, because Ballast Point is very cognizant about only distributing when they feel they can consistently meet the demand. Amy says thanks for the tour, Curt! Drinking beer is always fun, but that beer tastes even better when you feel a personal connection to it. That’s what makes the craft beer industry so special. 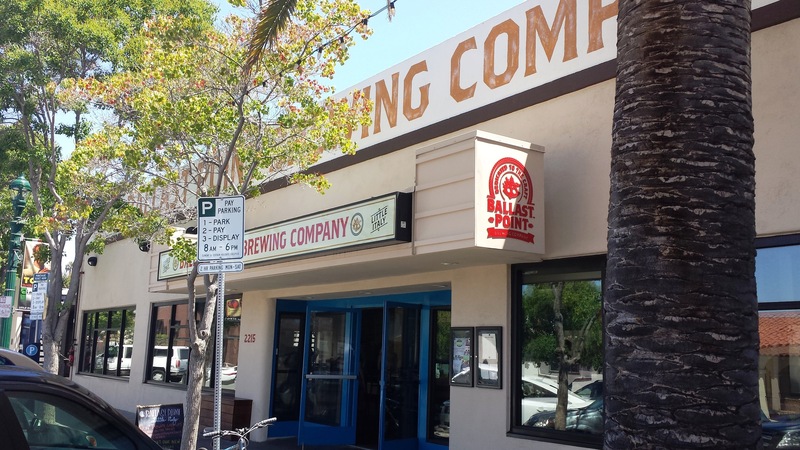 Ballast Point’s location in San Diego’s Little Italy neighborhood is walkable from many popular downtown hotels, so there is no reason to miss a visit if you are in town. In addition, they just remodeled their outdoor patio and it looks amazing. 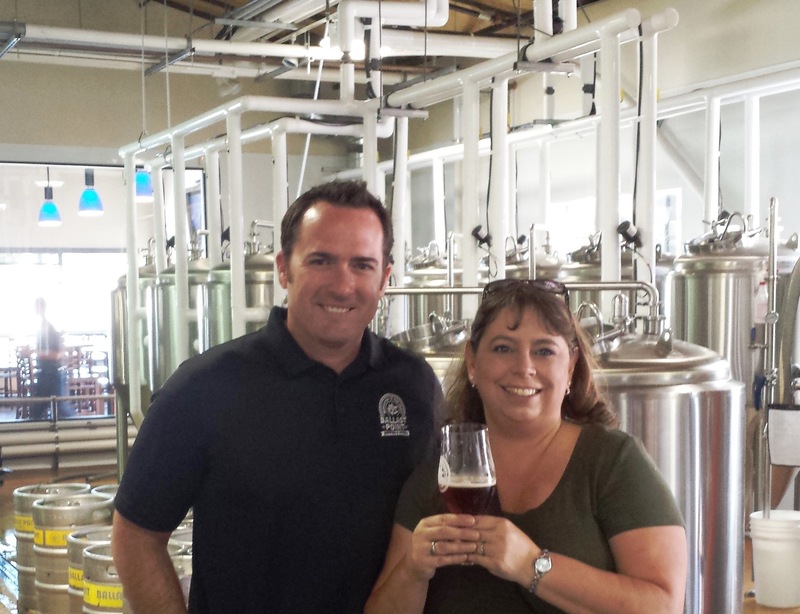 We had a wonderful time visiting multiple breweries in San Diego County. Look for an upcoming article on our crazy tour of four additional breweries. Stay classy, San Diego breweries!